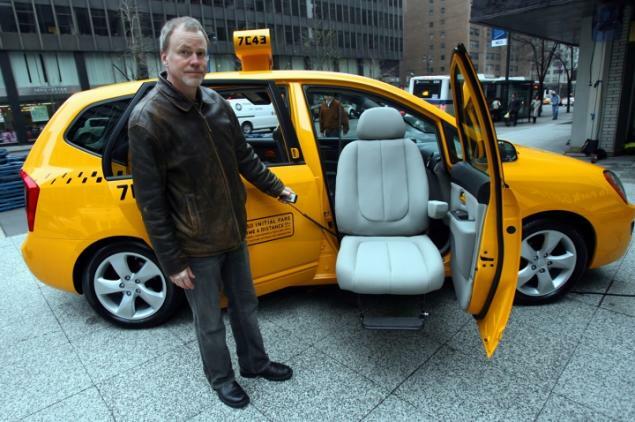 Mayor Bloomberg's taxi czar indicated March 5 a dramatic change in his stance on making the fleet accessible to the handicapped. The Bloomberg Administration has opposed a City Council bill that would mandate the city's entire fleet become handicap accessible because it wasn't satisfied with the quality of wheelchair-friendly cabs available. But Taxi and Limousine Commission Chairman David Yassky suggested it might take another view if another hearing on Councilman Oliver Koppell's bill is held. The TLC now believes Nissan can produce a suitably reliable model, Yassky said at a council Transportation Committee hearing Monday. "That's kind of a game changer in the discussion," Yassky said. "Now, it's an issue of cost verse the benefits." And cost may not be an insurmountable hurdle, he said. A Nissan NV200 that is handicapped accessible would cost about $14,000 more than a non-accessible version, Yassky said. That's about $3,000 a year because cabs are retired every four years or so, and state tax credits could offset that, he said. "The net difference to the medallion owner may turn out to be quite manageable or negligible," he said. There are 233 accessible yellow cabs in a fleet of more than 13,000. "That is not enough. Period. End of story," Yassky said. The Bloomberg Administration plans to sell 2,000 more medallions and mandate they be accessible, but that move has been stalled by a court challenge. And the TLC established a program where wheelchair users in Manhattan can call for one of the 233 accessible cabs, but their waits have been unacceptably long, on average 25 minutes, Yassky said. The TLC previously picked the NV200 as the Taxi of Tomorrow but refused calls by advocates and legislators to mandate a 100% accessible fleet.